TechnoKids Inc. welcomes its newest international associate, Vranceanu Cosmin Emanuel, who is introducing TechnoKids to Romania. With some years of experience with education in Romania and a strong background in technology, Cosmin has both the background and expertise to launch TechnoKids Computer Curriculum in his country. He has previously established early childhood education and learning centers that focus on fun, interactive programs to infuse a love of learning as children learn life skills. Adding TechnoKids technology projects will be a perfect fit. TechnoKids project based learning engages students with real life problem solving activities to integrate the teaching of technology. Cosmin’s strengths in computers in the business are extensive. As a network engineer, his roles have included developing business relations with major ISPs in Romania, designing, implementing, and maintaining fiber optic networks, and offering customer support. He is very well suited to managing a computer learning center. 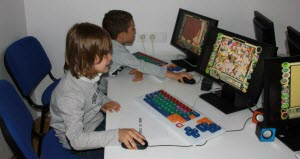 In June, TechnoKids Ltd. in Romania set up learning centers in the cities of Bucharest and Sibiu. Following that, the company plans to expand further, opening learning centers in every major city of Romania. We look forward to hearing news about how the children in Romania have fun and learn using TechnoKids technology projects! 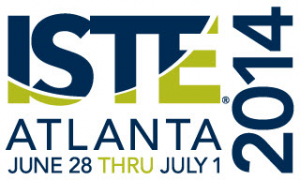 TechnoKids is at ISTE 2014. We are at the Software MacKiev booth #1628 and Learning Services booth #2228. Come and see our projects for the award-winning software KidPix 3D or talk to us about our Office 2013 projects. Discover resources for technology integration. Request a personal tour to learn more about TechnoKids. Find out about new technology projects. I have great news! Yes, we are! TechnoKids has already created a product line for Office 2013/2016, which is the full desktop version of Office 365. However, many educators want activities for the free web based apps including PowerPoint Online, Word Online, Excel Workbook Online, Excel Survey Online, and OneNote Online. A student can get access to these free apps by creating a Microsoft Account. Development is underway. I know many of you need the projects RIGHT NOW! Unfortunately, it will be several months before we are able to release an Office 365 bundle. Our plan is to develop a complete product line for Grades 1-8 over the next 12 months. UPDATE 3/21/2018: TechnoKids has now completed a full package for Microsoft Online. To see details, go to TechnoKids Microsoft Extra package. To find a TechnoKids project right for your students, view the Project Matrix. 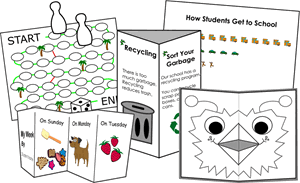 TechnoStories: In this project, students are introduced to word processing as they illustrate, write, edit, and share stories using simple storybook templates. TechnoMe: In this project, students build self-worth and develop an appreciation of differences as they create an All About Me slideshow. TechnoBookmaking: In this project, students use inspiring templates to publish a unique collection of stories. Make a tiny picture book, flip flap story, unfolding riddle book, layer book of facts, bookmarks, and more! TechnoJournal: In this project, students write a series of journal entries using Word Online. TechnoRestaurateur: In this project, students build entrepreneurship skills as they propose and develop a unique restaurant concept. Excel, Word, and PowerPoint Online are used to build spreadsheet, word processing, graphic, presentation, and data management skills. TechnoBiography: In this project, students research the life of a remarkable person. They develop advanced word processing skills as they compose a biography with a media gallery of artifacts. TechnoNewsletter: In this project, students create a fan club newsletter for their favorite musician, celebrity, or athlete. Using Word Online, they create a series of articles such as a top 10 list, word search, photo gallery, and opinion piece. The newsletter is shared with readers. Fans comment on their favorite entries and offer their own viewpoint. TechnoResearch: In this project, students develop research skills. They learn strategies for locating reliable web-based resources. Techniques are used to organize and cite sources of information. Students analyze their notes and summarize their findings to create a Fun Fact Card. TechnoMap: In this project, students use PowerPoint Online to create an interactive map that explains the importance of a location. Map markers highlight important areas and connect to slides with facts about a location, issue, or problem. TechnoCandy: In this project, students use Excel Online lessons to investigate a problem, conduct a survey, research packaging, and recommend a solution to boost candy sales. TechnoProject: In this project, students collaborate with the help of OneNote. Each team creates a digital binder. Facts are then organized into sections and tagged for easy reference. The final project is shared with others. TechnoBudget: In this project, students plan a shopping spree. They are granted a budget. They use Excel Online to track the items they can purchase. Comparison tables are created to determine the best deal. How far can they make their money stretch? TechnoPresenter: In this project, students create a presentation. They organize their facts using a range of slide layouts. To help prepare for public speaking they write a set of notes to accompany each slide. TechnoToon: In this project, students create a digital story using PowerPoint Online. Characters and callouts are sequenced to produce an animated comic strip. TechnoTimeline: In this project, students explain the significance of historical events with a timeline using PowerPoint Online. TechnoDebate: In this project, students create an animated conversation. By sequencing the order of callout bubbles two characters discuss pros and cons to an issue. Fellow classmates join the debate, by stating their opinion using comments. Do you want to stay up-to-date on the development of the Office 365 technology projects? Please email information@technokids.com. We will send you periodic updates. If there is a project you need ASAP, let us know. The schedule is flexible at this stage of development. We will try to accommodate your requests.